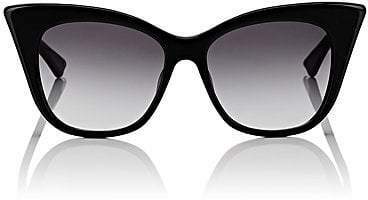 Dita's glossy black acetate Magnifique sunglasses are accented with anti-reflective black gradient lenses. 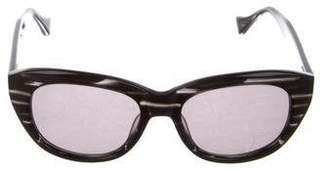 A nod to old Hollywood glamour, this Japanese-crafted pair is designed with striking cat-eye frames. Goldtone metal logo at temple tip. Cat-eye shape. Clear nose guards. Two silvertone metal pins inset at temples. 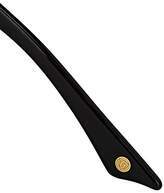 Black gradient lenses with anti-reflective coating. 100% UVA and UVB protection. 56mm eye size. 17mm bridge size. 143mm temple size. Available in Black. Acetate. Made in Japan. Includes hard protective case and cleaning cloth. 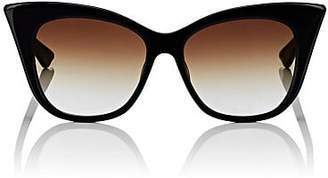 Dita Women's Magnifique Sunglasses - Black A great designer gift. Shop Dita at Barneys New York.